If you can find sugar free peach jello, it will give you a deeper peach flavor. I usually end up using lemon because the peach is harder to find. You can use regular gelatin if you aren’t concerned about calories or carb counts. You can also make this with fresh sliced peaches — about two cups. Wheels loves fresh peaches so I have to hide them in order to have enough to make something. Or make the dish the instant I get the peaches home from the grocery — before he has time to know they are in the house. lol It’s better to keep a couple of cans of peaches available in the cupboard. I use light or no sugar added peaches and drain them well so the cheesecake doesn’t become soggy from the inside out. Just before adding the peaches, take a sharp knife and run it through the peaches in the colander to make the pieces a little smaller. Just seems easier to cut into nicely defined squares. 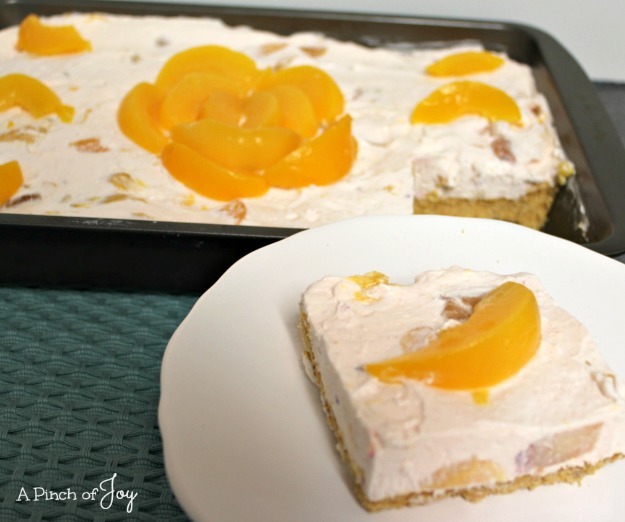 This time I wanted a little peachy bling so I set aside some peach slices to decorate the cheesecake after it had firmed up in the refrigerator. 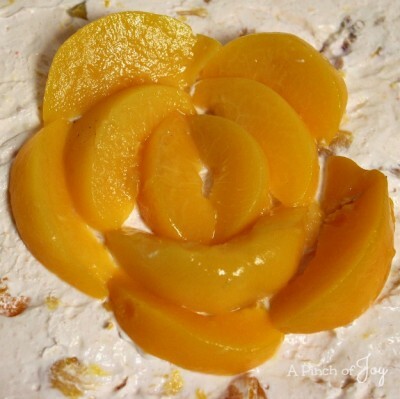 Use sixteen peaches so you can move a peach to the top of each square as you slice and serve it. Start in the middle and lay the peach slices as shown to make the rosette. Easy!!! 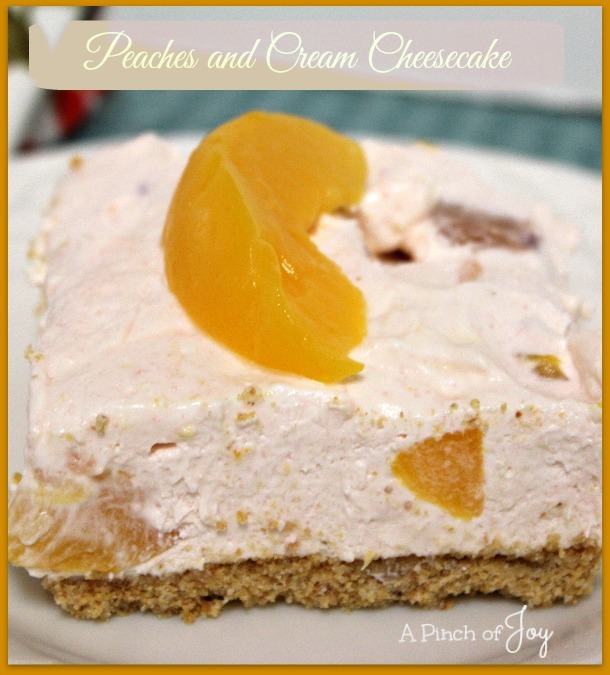 A light and cool ending for a summer meal or a not too sweet dessert for a gathering or a dessert bar, this no bake cheesecake is all Peaches and Cream! Mix graham crumbs, melted butter and sugar and press onto bottom of 9 x 13 inch pan. Pour peaches into colander and set aside to continue draining. Beat softened cream cheese and sugar until blended and fluffy. Add dry gelation and mix well. If desired, set aside 12-16 slices for garnish. Fold peaches and whipped topping into cream cheese mixture. Refrigerate until firm about four hours or overnight.